I WONDER HOW well romance scenes go over in an action/intrigue novel. Opinions? I need help here. My mom wants the romance in there because my novel has a pretty violent, mysterious plot and it makes her cry — romance would give her a reason to read it. I suppose there are a lot of other people like my mom out there. I WANT THE romance in there, too. You know, just ’cause. There has to be a little. But very little. OR VERY LOT? I don’t know. Back and forth, back and forth I go. Perhaps any romance at all will take what could have been a great cliffhanger and turn it into a mushy slope. I don’t want that to happen. But on the other hand, it could be like Superman (yes, yes, here I go again). Superman survives with a little romance, doesn’t he? I mean, it gives you more reason why Clark Kent has to live. He has to, because if he didn’t, what would happen to Lois? IS IT THE same way with Edward Tremain and can’t-tell-you-who? Such a touchy, touchy topic. 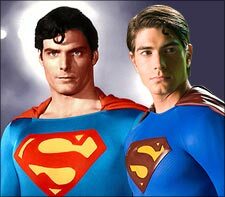 BY THE WAY, while Brandon Routh is definitely more photogenic, you just can’t get me out of my Christopher Reeve phase. Won’t happen. I think that there should be at least a little romance…. course, you know me, I just love romance and action mixed… I don’t really think it’ll ruin it, if it is good romance (not the cheesey ‘Love Comes Softly’ junk. hehe).